Boys Like You by Juliana Stone (eProof) - One mistake. And everything changes. I was really intrigued by the pain of this book when I first read about it. What had happened to these two people? Why were they hurting so much? How were they going to help each other? It sounded so good! And I'm pleased to say it's awesome! The pain and sadness in Boys Like You is palpable. It's thick in the air, and the grief of both Monroe and Nathan weighs them down. Boys Like You is a story that will tug hard on your heartstrings, and had me so close to tears a number of times. What happened with Monroe isn't something we find out about until maybe half way through, but there are little clues throughout the first half, and most of the time my theories were wrong. You can guess from the description above what happened with Nathan, however, and what happened with him is pretty much shared from the get-go. It's a heartbreaking story, but an uplifting one, as together the two find a away through the sorrow and back to life. It's beautiful and hopeful, and completely wonderful! Boys Like You felt like a very quick read. I read the whole things in about three or four short bursts of an hour or so, and I'm a slow reader. Although there was obvious chemistry between Monroe and Nathan,, kind of felt like we missed a fair amount of development between the two as time skipped forward in time, a week would go by with only the barest of mentions of what happened to them. Although their connection was based on their understanding and shared pain, it felt much too soon for them to believe themselves in love; for what I saw of them together, those gaps made it seem like the time they spent together was about six or seven days - the days we actually witness - rather than a whole summer. The intensity for love was right, and there was some serious sexual tension, but it felt like too much too soon as I didn't get to see enough of the romantic development. But that's probably because the focus was more on how they helped each other through their pain with understanding and love, rather than strictly on the romance itself. 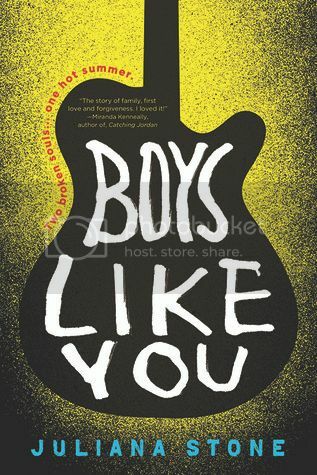 Boys Like You is such a sweet and moving story of hope, self-forgiveness, and stepping out of the dark. A fantastic YA debut! Thank you to Sourcebooks Fire via NetGalley for the eProof. I really do love the sound of this, and the cover is gorgeous.